Whether you’re a longtime gardener looking to establish some new beds, or a new recruit planning your first plot, it can seem pretty daunting to start a garden. What type of garden do you want? Raised beds or rows? Do you use mulch? What about soil amendments? How do you plan your new garden? This list goes on and on. Feeling overwhelmed? Luckily, with the right information and tools, it doesn’t have to be too intimidating to start a garden. As a lifelong gardener, I’ve started and tended many of my own gardens over the years. I’ve worked out all the tough decisions time and time again, and I know how to break them down into manageable bits. 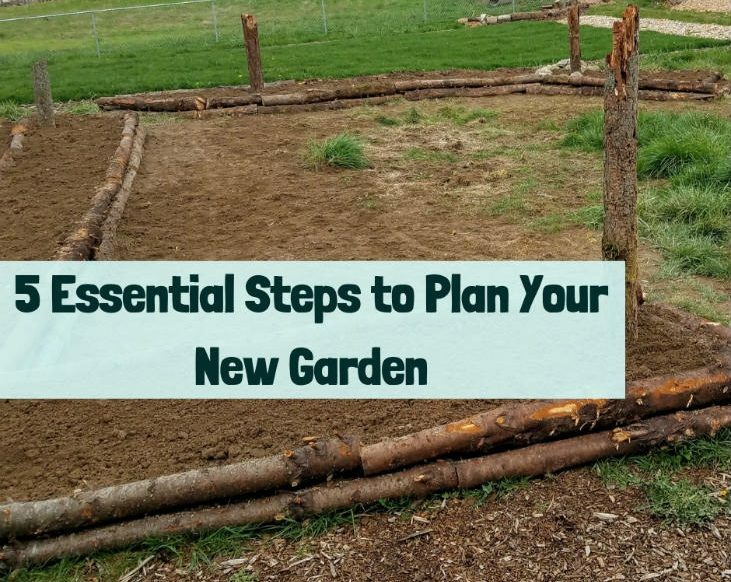 This post will guide you step-by-step through the process to help you plan your new garden and keep you from feeling overwhelmed. Oh, and don’t forget to get your free print-friendly cheat sheet that you can take outside with you as you work through these steps. Step 3 – Planning Your New Garden: What Type of Beds? Step 4 – Planning Your New Garden: How Big? If you plan your new garden in the spring/summer you can sheet mulch the area in the summer/fall to let nature prepare it for you by turning all the existing plants into rich soil. By the following spring the area will be ready to plant. One of the best times to start a garden is late summer or early fall. This isn’t when you’ll start planting, of course—it’s when you’ll start building your garden beds. That means spring and summer is the perfect time to start planning your new garden. Why start a garden in late summer or early fall? When you start your garden, you will likely be converting space that currently has a lawn or other plants already growing there. Most gardens I have started have been in an existing lawn. Lawns are often open spaces in full sun, making them the ideal places to put a garden. But you need to get rid of the lawn and any other vegetation first. By starting your garden at the end of summer, you can smother the grass with mulch or compost to transform that lawn into great soil that will nourish your scrumptious veggies. It takes time for the grass and other vegetation to break down into soil. When you start the process in late summer or early fall, you can let nature do most of the work of removing the grass in the wintertime, while you’re warm inside enjoying hot cocoa. By the time spring comes around, the grass will be gone, and you won’t have had to do any digging. This also gives time for beneficial soil life to move into the garden to help your vegetables grow. But if you’re in a rush to get started, you can plan your new garden in the spring and start it the same season. You’ll just need to do more of the work yourself instead of having nature help you out. I’ve dug out the grass by hand before, and trust me—it’s not fun. Nature will happily do it for you if you give it time. If you can take the time to plan your new garden in advance, then do yourself a favor and work with nature to save yourself the extra physical work. This is my new kitchen garden that I'm just finishing up in spring 2019. This garden is just outside my backdoor making it easy to visit. When completed the middle area will be for family and friends to gather with a picnic table and BBQ. When planning your new garden, you need to make sure your garden gets plenty of sunshine. You want to have at least 6 hours of sunlight if you can. Less can work in some situations, and sometimes you don’t have any options, but you will want to put your garden in a nice sunny location. You also want to keep your garden close to where you spend most of your time. Pleeeease don’t put your garden in the back corner of your yard where you never go! You want your garden as close to your back (or front) door as possible. This way you will walk past your garden on a regular basis. That will make it very easy to maintain it, and more importantly, to enjoy and harvest it. Now imagine having the garden a couple steps outside your door. Which site would inspire you to go outside and harvest some vegetables for your breakfast? If you’re anything like me, then the less distance you have to walk, the more likely you are to actually go out and harvest—especially in the morning! This is really important when you are planning your new garden. But don’t forget! You still need sunlight. So when you’re choosing where to start a garden, you’ll need to strike a balance between keeping the garden close and giving it enough sunlight. I recommend keeping your main kitchen garden close to your house and then have a few extra beds further out in the sunniest spots for vegetables such as peppers and other sun-loving plants. You will also need to keep some tools nearby, and a water source. If you plan your new garden near your house, you should have an easy source of water and it will be easy to keep your tools close by. I love building hugelkultur beds. This picture is showing the inside of one of the garden beds from the previous picture. Hugelkultur beds are a great option if you have the time and energy to build one but there are other great options. When you picture a garden, what do you think of? Do you picture rows or beds with paths in between, or a series of raised beds with paths around them? What shape is your garden? Most people picture a rectangle—no surprise here! And it’s no wonder—most gardens look like this. But there are other options to choose from, and a rectangle may not be the best fit for you. You can be a bit creative when you plan your new garden, and think outside the small, rectangular box. Why are most gardens rectangular? If you’re tilling the soil, then straight rows are great. Machines like things to be uniform and regular. But you are not a machine, and your soil doesn’t want to be tilled. Tilling destroys soil life, keeping you dependent on fertilizer inputs, and it makes it harder for your soil to retain moisture. In other words, by doing less work you’ll have better soil and produce more abundant harvests. That sounds like a win-win situation to me! So what are the options for your garden? You can be very creative with planning your new garden, but here are some basic types you can choose from, along with the pros and cons of each. Series of Rows: The traditional garden with long straight rows of plants in single file, and paths in between them. It’s easy to plant and harvest, but you lose a lot of space to the paths that could be used to grow more food! Series of Regular Beds: Another traditional garden design that is similar to the series of rows. But by widening the rows into beds, the number of paths is reduced. This gives you more growing space. Planting is more complicated because plants can shade each other. Raised Beds: Same general concept as regular beds, but more complicated to build and potentially costly. Raising the beds results in a warm micro-climate that can extend your growing season but it may dry out faster. Hugelkultur Beds: The same as raised beds, but they involve burying wood inside the bed. The wood holds water and slowly releases nutrients, giving you a very bountiful, low-maintenance bed. Check out our blog post all about this type of bed. Keyhole/Mandala Beds: Basically, a regular bed or raised bed that’s shaped like a circle with a path going part-way through the middle, forming what looks like a keyhole. Allows for more space to be used for growing food rather than for paths. My personal favorite type of garden is the hugelkultur be​​ds. (The name comes from the German words hugel for hill, and kultur for culture, like agriculture.) These are essentially fortified raised beds. While these take a lot of work up front, your future self will thank you for the investment—it will save you loads of work down the road. This type of garden bed can greatly reduce your watering needs and help you build great soil filled with beneficial organisms that will help your vegetables grow. A garden with a series of rows really only makes sense if you’re planning on selling most of your harvest, but you can start an amazing garden that works with nature through any of these options. For the first-time gardener planning your new garden, I would recommend using regular beds or raised beds. When planning your new garden you don't need to make it huge. This small garden outside the apartment I used to rent still provided a lot of food despite not having a lot of space. There are tomatoes, lettuce, potatoes, onions, peas and other plants growing in this small kitchen garden. I used vertical space to fit more plants into the small space. Starting your garden can be so exciting—all those visions of fresh tomatoes, carrots, basil, peppers, and more are filling your mind. It can be tempting to want to create a huge garden to grow all these great plants. If you’re starting your homestead, then self-sufficiency is likely a major part of your goals. Growing most of your food can give you an amazing amount of freedom. So, when planning your new garden, you should create as large of a garden as possible, right? Starting a garden is not a one-time project. It will require regular visits, especially during the harvest season. If your garden is too big, you’ll end up feeling overwhelmed and frustrated. You want to enjoy your garden. It shouldn’t feel like a frustrating chore that you come to resent. You also need to consider how much sunny space you have in the area near you house. So how big should you plan your garden to be? If you’re new to gardening, try to limit your garden to 15’x30’, or 450 square feet. This will give you 4 raised or regular beds that are each 3’x10’ with 3’-4’ paths around them, like the one below. That gives you 120 square feet of growing space. Diagram showing the described garden layout. Paths take up a significant amount of space but make it easier to harvest and to do other tasks like weeding and watering. If you shrink the paths to about 2-3 ft, you could expand the size of the beds to be 4’ by 11’ for a total of 176 square feet of growing space. Or you could keep the original bed sizes and reduce how much overall space you need for your garden. If you got creative and used keyhole garden beds, you could fit in even more growing space or further shrink the total area your garden is taking up. When planning your new garden, make sure you don’t make your paths too small, or you may have trouble harvesting or getting a wheelbarrow in. On the other hand, if space isn’t an issue for you, then you’ve got even more options to start your garden. The kitchen garden I’m building right now is a series of curved hugelkultur beds with ample pathways, circling the area that will become our outdoor gathering place. I always try to use space efficiently, and in this case the goal is not just to maximize food production, but also to create a comfortable and abundant space for my family to live, work, and play. But for now, let’s look back at those sample 3’x10’ garden beds. Does 120 square feet seem small? Large? What about 176 square feet? Here’s some perspective for what you can grow on that space. To grow all the vegetables for one person to use during the growing season would take approximately 200 square feet, and it would take around 4,000 square feet to grow everything one person needs for a year. Don’t try to grow all your own vegetables right away if you are just starting out. You’ll end up overwhelmed and burned out. This goal doesn’t just involve lots of gardening—you’d also need to preserve a large amount of your harvest for the off season in addition to using it fresh. Wild homesteading is a journey. Take your time. You can always build more later. So, your 120 square foot garden won’t grow all the vegetables you need. But it might grow all your tomatoes, lettuce, zucchini and beans—but perhaps you still buy your peppers and eggplants. The other reason to plan your new garden to be on the small(ish) side is that you have to get used to cooking with what is ready to harvest at the moment. This takes practice and a willingness to be creative or flexible with your cooking. Tomatoes might only be available from July through September for example. Spinach only in the spring through June, and then again in the fall, but not in the summer. Even 120’ of growing space can be a lot to manage if you’re just starting out. Don’t feel like you need to push it. You can always expand your garden later, but it’s frustrating when you have to scale it back. Giving up growing space can feel like you’re losing, but expanding later will feel like a victory. Wow – that’s a lot of information. Let’s look at what we’ve learned so far. Step 1: Start a garden in late summer or early fall to let nature do more of the work for you to turn grass or other existing plants into great soil. Spring and summer is a great time to plan your new garden. Step 2: Pick a sunny location as close to your house as possible that also has a source of water and a place for your tools. Step 3: Pick which type of garden beds to build. I recommend raised beds or regular beds for someone starting out. Hugelkultur is an amazing option that will reduce your long-term workload, but it takes more upfront investment. Step 4: Keep your first garden small – 30’by 15’ is a great first garden space, with four 10’ by 3’ regular or raised beds. Okay, let’s keep going—just one more step left for planning your new garden. Oh deer... these critters are a part of the wild but finding a balance with them can be challenging. I ended up fencing my homestead to keep them out since there are no predators to keep them in check in my area. Sometimes you’ll run into animals that will just wipe out your garden if you don’t fence them out. On my property, deer are the culprits. On my parents’ place not too far from here, deer and rabbits have both been an ongoing problem. Other people struggle with racoons getting their corn. I thought if I provided lots of native plants for the deer and other wildlife, that we could reach a balance, and everyone would go home happy. I was right about the “and other wildlife” part… I was wrong about the deer. Without a healthy population of predators to keep their numbers in check and keep them moving, deer—and potentially rabbits—will just eat all your hard work to the ground. But with smaller critters like voles, you can reach a balance if you support their predators like hawks, owls and coyotes. Make sure to plan your new garden to support these critters (as much as possible, depending on where you live). Different fence types work well for different animals, depending on what the particular menace is in the area where you live. You can find great examples of all different fences online. Another option is to get the book Living with Wildlife in the Pacific Northwest by Russell Link. Since rabbits, deer, raccoons, and many other critters are widespread across North America, this book will help you even if you live outside the Pacific Northwest. The book covers 68 species of mammals, birds, reptiles, and amphibians and offers solutions for keeping marauding critters at bay. If this is your first garden, how do you know who the local troublemakers are? Observe your property. This is really important when you’re planning your new garden. If you see deer and rabbits, you may need to fence your new garden depending on how often they visit your turf. Fences can be essential, but don’t try to exclude all wildlife. Having a balanced ecosystem will be an important part of pest control for your garden. Promoting that balance is another factor to consider when planning your new garden. If you plant native plants and create abundant areas for wildlife, you can live in balance with most of your wilder neighbors. Deer are a major exception, but birds and even rabbits (if their numbers are low enough) can live compatibly with your garden if you provide them wild areas too. If all you have is a huge expanse of grass and then you start a garden in the middle of it, your garden will be visited by all the critters in your area. Large expanses of mowed grass (and most forms of landscaping) are a desert for wildlife, while your garden is an oasis of mouth-watering food. Of course all the critters will be drawn to it! So, fence your garden if you have issues with deer or other critters like rabbits, but don’t try to exclude all wildlife. Consider including native plants and habitat for predator species. Otherwise, you’ll end up working hard and getting frustrated, and you’ll likely have insect or other pest issues since you removed their predators. Now that you know how to plan your new garden, it is time to start getting to work! Plan your new garden in the spring and summer, and start your garden in late summer or early fall. Choose where to place your garden. Determine what type of garden beds you want. Determine how big your garden should be. Protect your garden from unwanted critters. Work through these steps, and make sure to get your cheat-sheet to help you plan your new garden. Once your garden is all planned out, the next step will be to build it. Here are some resources to help you get started. We would love to hear from you so please leave a comment talking about why you want to garden. And don’t forget to get your free cheat-sheet with all the info you need to plan your new garden! I am currently planning my very first garden, so this post is very helpful to check everything is in line and that the garden will work for my needs. I especially love the brief and clear pros and cons of the different garden bed styles! I also shared my own plans on permies.com. Hello Alex and thank you for the comment! I will go check out your post on permies and I got some pie to share over there! 🙂 I’m glad you found the post helpful and good luck with your new garden!